Famous range of mountains with fantastically eroded peaks and deep, sheer chasms to the walls of which fantastically twisted old pines somehow cling. A place of pilgrimage and contemplation for centuries, it is dotted with pavilions and monuments. Very Chinese landscape you will feel you are inside a scroll painting. Walk the superb paths around the peaks, or clamber up ancient rock-hewn stairs from the base. The Huangshan are a World Heritage Site and very popular in China, so do not expect to be alone until you have walked some way. Public holidays should be avoided. Come prepared for unpredictable mountain weather. Very 'Chinese' landscape: you will feel you are inside a scroll painting. The Huangshan are a World Heritage Site and very popular in China, so do not expect to be alone until you have walked some way. Public holidays should be avoided. Downgraded in 2012 because of the extreme visitor numbers. Huangshan, the Yellow Mountains, are an extraordinary cluster of over 70 outrageously eroded granite peaks which poets and painters have come to contemplate for well over a thousand years. The Chinese see the Huangshan as their country's most beautiful landscape, and their fame is fully justified: gothic spires and dinosaur spines, dizzy thousand-foot plunges into dark, water-scoured ravines; twisted pine trees clinging to invisible crevices, azaleas glowing against the grey rock and the fresh spring woodlands. This is a favourite subject of traditional Chinese landscape painting, and the mountains can look eerily familiar as a result. The vegetation is stunning: most famous is the stunted Huangshan pine, with its flat pans of leaves and extraordinarily twisted branches, each one almost a caricature of itself. The relatively sheltered gullys nurture a wide variety of trees, and in spring great smears of pale pink azalea tree-shrubs add vibrant contrast. If you are able, you should climb up to the summit area, via the forbidding Eastern Steps, an arduous grind of thousands of ancient hand-hewn steps up a great cleft in the mountainside, or the longer and tougher Western Steps. The easy alternative is cable car (beware huge queues in high season). You will need to be up early for the famous sunrise over the sea of clouds that covered the lowlands below. It is a cliché, and you will be far from alone, but it really is fabulous. A rumpled blanket of cloud extends to the horizon. The jagged ridges of the Huangshan massif sink down into it, isolated lower peaks protruding, like islands, further away. The Huangshan massif is like a crown. An undulating, wooded centre rises to a circle of peaks on the outside of which are the extraordinary chasms and broken ridges writhing away into the distance, which make the range so famous. Most visitors pant their way between the famous viewpoints at the edge of the central plateau. Don't ever expect to be out of sight or earshot of mankind in all its glory along the main routes. 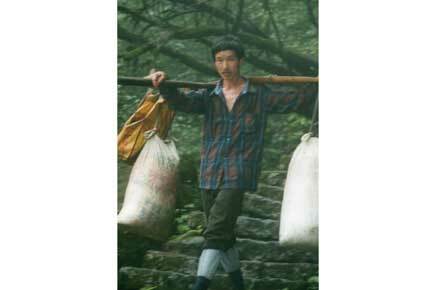 (We downgraded Huangshan's rating in 2012 because of the extreme visitor numbers.) As soon as you leave these paths, however, you can be alone with the full magnificence of nature. Ths summit is littered with famous, poetically named sites, viewpoints and pavilions. You should see the Cloud Dispelling Pavilion, the famous Flying Rock, a giant boulder perched teetering on a tiny fulcrum, and the Bright Summit Peak, the range's highest point at 1,841m. You must not miss the upper Western Steps, which wind under the great, sheer Lotus and Celestial Capital Peaks, passing some spectacularly twisted pines, and then teetered uncomfortably along a knife-edge, smooth rock quickly becoming precipice on each side, dropping into a hole under boulder and scrambling down several hundred very steep and narrow steps through a deep cleft. While many people come up by cable car for the day, you should spend at least one night on the mountains if at all possible. The Chinese see the Huangshan as their countrys most beautiful landscape, and their fame is fully justified: gothic spires and dinosaur spines, dizzy thousand-foot plunges into dark, water-scoured ravines; twisted pine trees clinging to invisible crevices, azaleas glowing against the grey rock and the fresh spring woodlands. This is a favourite subject of traditional Chinese landscape painting, and the mountains can look eerily familiar as a result. The Huangshan massif is like a crown. An undulating, wooded centre rises to a circle of peaks on the outside of which are the extraordinary chasms and broken ridges writhing away into the distance, which make the range so famous. Most visitors pant their way between the famous viewpoints at the edge of the central plateau. Dont ever expect to be out of sight or earshot of mankind in all its glory along the main routes. As soon as you leave these paths, however, you can be alone with the full magnificence of nature. Ths summit is littered with famous, poetically named sites, viewpoints and pavilions. You should see the Cloud Dispelling Pavilion, the famous Flying Rock, a giant boulder perched teetering on a tiny fulcrum, and the Bright Summit Peak, the ranges highest point at 1,841m. You must not miss the upper Western Steps, which wind under the great, sheer Lotus and Celestial Capital Peaks, passing some spectacularly twisted pines, and then teetered uncomfortably along a knife-edge, smooth rock quickly becoming precipice on each side, dropping into a hole under boulder and scrambling down several hundred very steep and narrow steps through a deep cleft. “Huangshan is the No. 3 beauty spot in the world”, proclaimed the pamphlet, a fine specimen of the traditional Chinese love of lists and categorisation which begged questions such as “who says” and “on what criteria”. There would be no point asking whether any of the top 10 are outside China. Huangshan, the Yellow Mountains, are, however, truly extraordinary: a cluster of over 70 outrageously eroded granite peaks which poets and painters have come to contemplate for well over a thousand years.